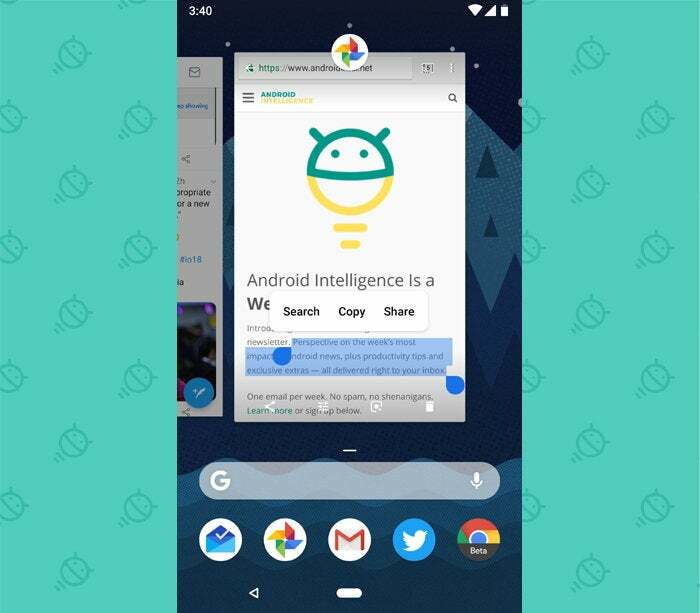 P is for productivity: These nine new Android P features will help you get more done with less effort. 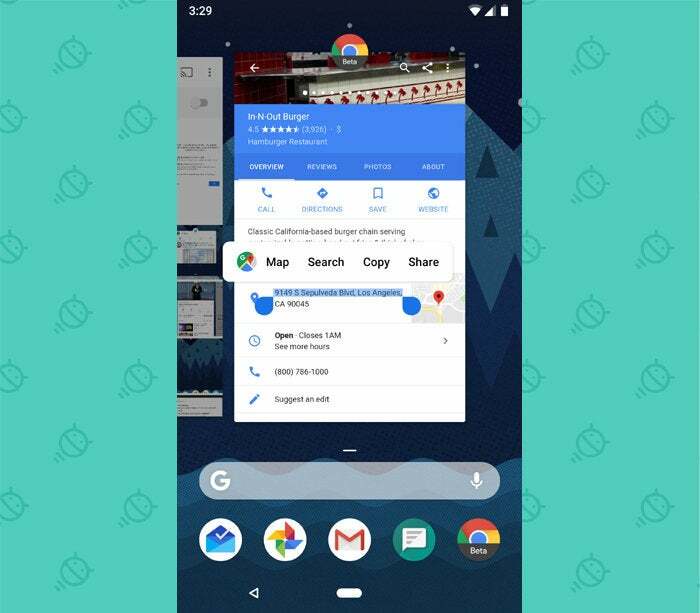 That wacky new gesture navigation system may be Android P's most attention-grabbing element — for better or maybe for worse — but the latest version of Google's operating system also has its share of small yet significant changes. And you know what? Those seemingly subtle touches are often the ones that end up bringing the most meaningful improvements to our day-to-day lives. To wit: The nine new Android P features described below won't all command attention. They won't all appear in ads or atop reviews. Some of them might not even be noticed by average users, at least not in any overt sense. But all of them have the potential to help you get more done with less effort — and as far as I'm concerned, that counts for a lot. 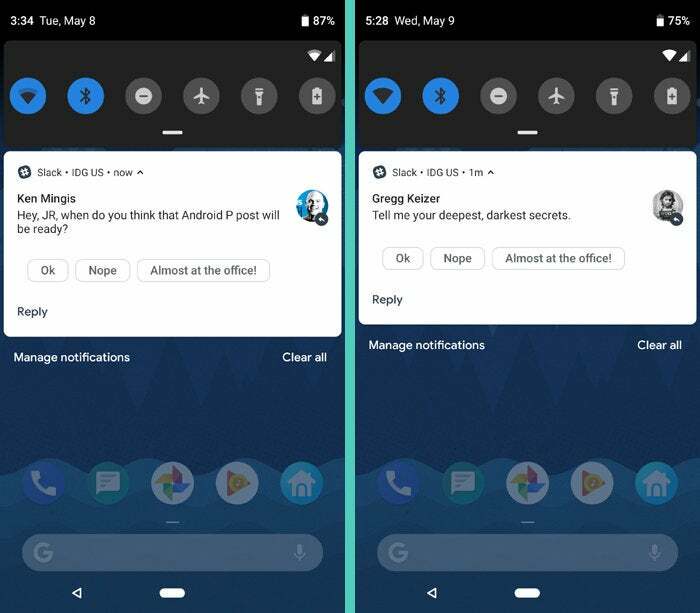 Google's system for predicting short responses — as seen in Inbox and more recently Gmail — spreads to the operating system level with Android P: In notifications from a variety of messaging-oriented apps, including both Slack and Pulse, Android now provides a set of one-tap response suggestions within the notification of every message that comes in. These obviously aren't going to work in every scenario or replace all of your personal communication — but for quick 'n' simple sorts of responses, they could end up being real time-savers. Well, eventually, anyway. As of now, the system is kinda half-baked and seems to have just one standard set of responses for each app — responses that are provided time and time again, without context and no matter how little sense they make. On the plus side, that's given me creative license to have some wildly amusing and entirely nonsensical conversations with co-workers. Hey, it's only a first beta. 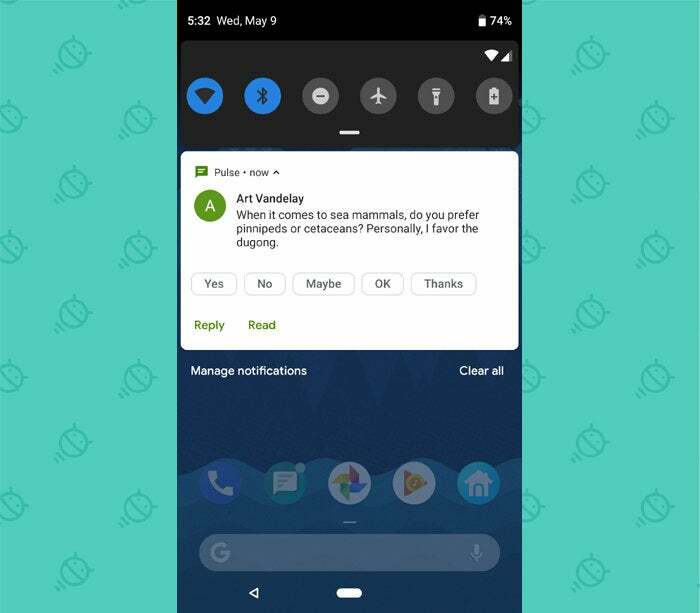 Android P's new Overview interface is a bit of a mixed bag, but one intriguing element is its newfound ability to let you select text from apps without ever actually opening them. All you have to do is press and hold on an area of text within an app's thumbnail, and Android will start to select it. You can move the cursor to find the exact area of text you want — then copy it, do a web search for it, or share it directly to another app. The "smart" part of the system will detect when you're selecting something like a physical address, a URL, or a phone number and then offer appropriate suggestions — like sending the address to Maps for navigation, opening the URL in Chrome, or dialing the number in your Phone app. This part is especially cool: In that same Overview interface, you can press and hold an image within an app's thumbnail — and then share that image directly to any other app on your phone. Let's put it into a real-world example: Say I see an image in the thumbnail for Twitter on my phone's Overview interface. I can press and hold that image, and without ever opening the app or dealing with its own internal share function, I can send the image directly into Gmail for sharing, into Drive for saving, or into Slack for sending to someone else. I could even send it directly into Photos for long-term storage or into a photo-editing app like Snapseed for instant manipulation. Last but not least, the really cool part: You can select and copy text within an image in Overview. In the example below, I'm looking at a screenshot of a website that I saved to Google Photos. When I press and hold on any of the text within the image, Android selects it and lets me copy, share, or search. This one will take some time to be useful, as it'll require support from developers before it offers much value — but Android P's new Slices feature could eventually reshape the way we find information and actions within apps. With Slices, you'll soon be able to search for something like "Lyft" in your home screen search box, and Google will show you things like the current wait time for a ride along with icons to order a ride home or to work right then and there. You can interact with the info and take care of business without ever having to open the associated app. And from the sounds of it, the search box is just the beginning of where Google intends to surface this sort of info. The Slices system isn't live yet — nor, presumably, are many developers on board with the effort at this early stage — but it's definitely something to watch for anyone interested in optimizing efficiency. 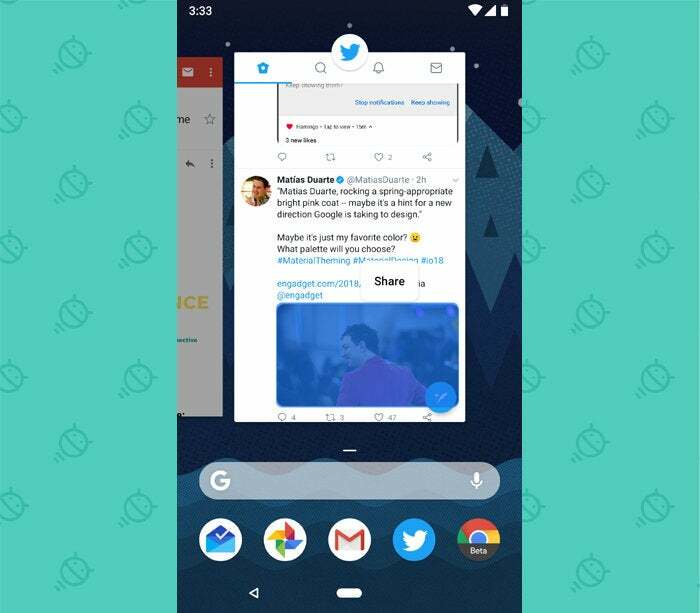 We saw signs of this back in February, and sure enough: Android P brings about a much simpler and more direct system of handling screenshots. 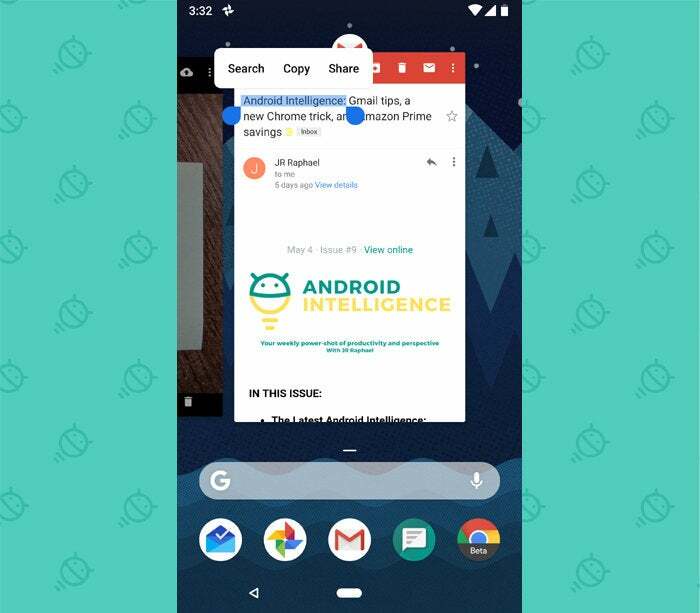 Anytime you capture a screenshot with Android P, the system shows a box at the top of your screen with options to share, edit, or delete the image with a single tap. Selecting "Edit" takes you to a simple but effective editor, with easy-to-use commands for cropping the image, highlighting it, and annotating it — and then saving or sharing your final result. The obvious rule of electronics: You can't be productive on your devices if your devices are dead. 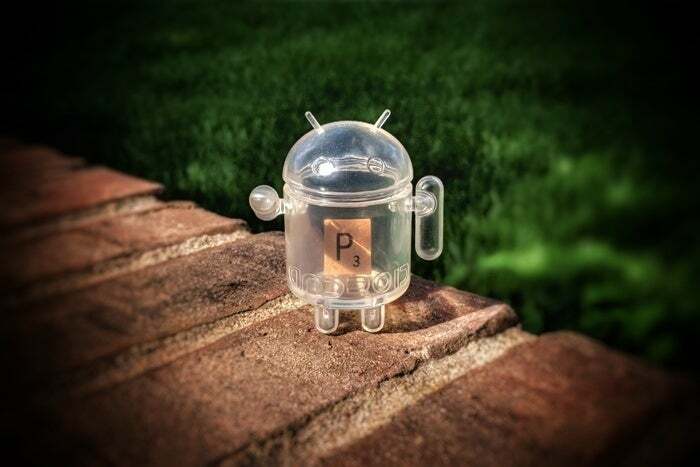 Android's come a long way with power management over the past few years, and the P release looks to step things up one more noteworthy notch with a more intelligent form of battery preservation. 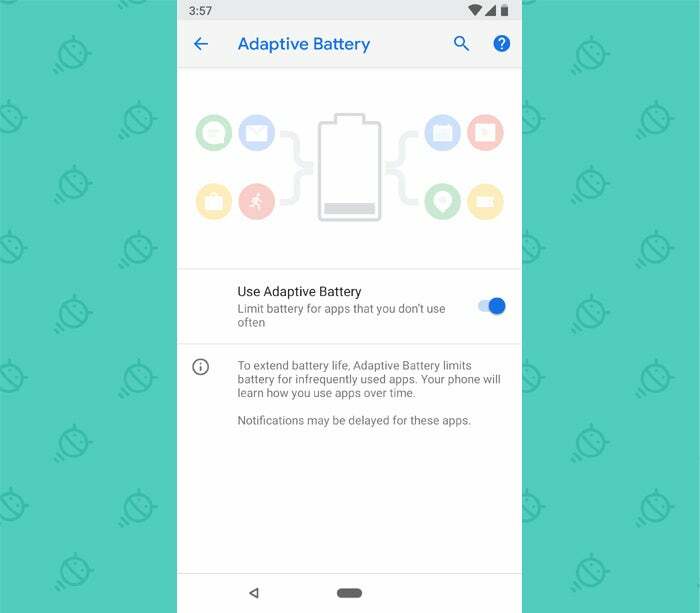 The new system, called Adaptive Battery, learns how you use apps over time — and then limits the power-draining capabilities of apps that you don't use often. You have to turn the feature on in order for it to operate, but it certainly has the potential to extend a charge even further than what's presently possible. 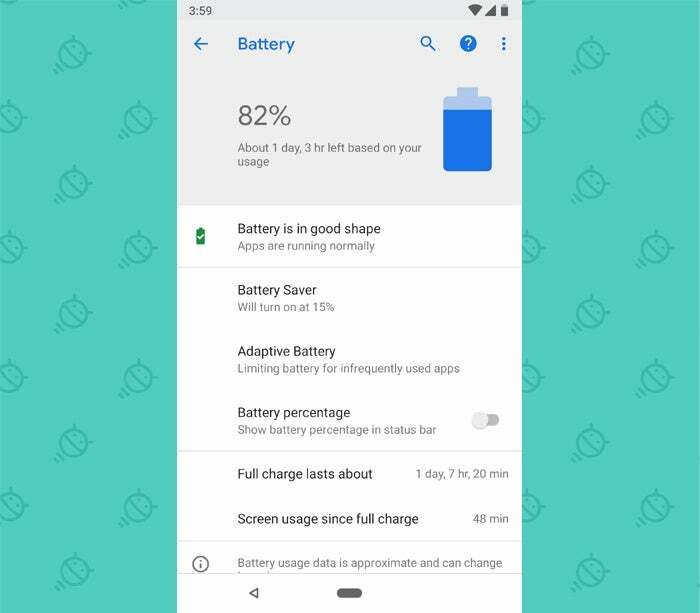 The system also delivers more precise estimates of exactly when your phone is likely to die based on your typical usage — both in the Battery section of your system settings, and even more precisely when your battery is running low and time is running out. Trying to keep your screen brightness at the right level is a never-ending battle, and Android's auto-brightness feature has never been particularly great at automating the process. 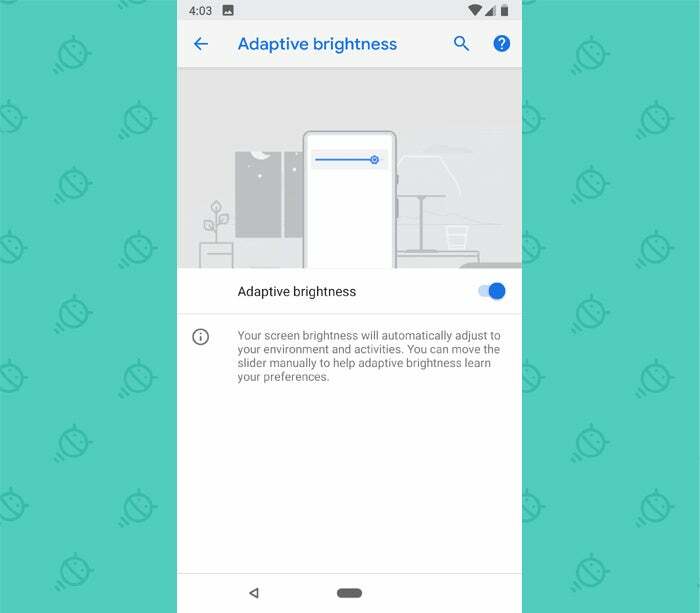 A new Adaptive Brightness feature in Android P aims to fix this by observing how you adjust the brightness slider in different ambient lighting settings over time and then adapting to your preferences and automating that same behavior. I haven't had the Android P beta on my phone long enough to comment on how well it actually works, but it sure sounds like a positive shift — one that could allow us to focus more on what we're doing and less on how we're doing it. We've all been there: You're in the middle of doing something on your phone, and suddenly the screen rotates into landscape orientation. You have to do that awkward little shaky-hand dance to convince it that yes, you're holding it upright, and get the damn thing to shift back into portrait mode. It's enough to make you want to slam your phone on the ground and run. 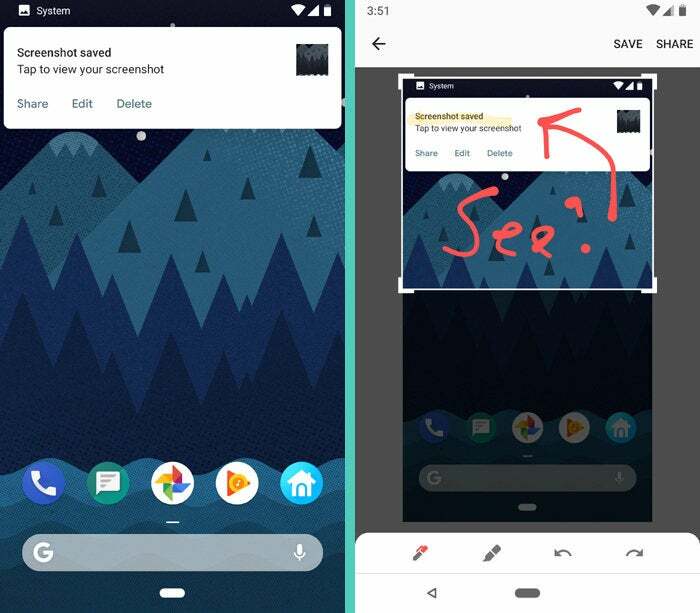 Android P has a solution: Instead of automatically rotating your screen whenever the device thinks you're changing orientations (or forcing you to turn off screen rotation altogether), a new rotation button shows up in the corner of the navigation bar anytime your phone is being turned. It's then up to you to tap that button if you actually want the display to rotate — but since the button is right there (and only present when needed), it's incredibly easy to do. And if you'd rather stick with the old fully automatic rotation setup instead, of course, that's still an option as well. But for those of us who value our sanity, this new path is an excellent choice. Sure, our phones can help us be productive — but just as often, they can serve as a distraction and make it more difficult to get work done. Android P will soon gain a simple new way to tell your phone to hush: Set it on a table, then flip it over so its display is facing down. The device then won't ding, vibrate, or otherwise interrupt you until you pick it up again (though you can whitelist certain high-priority contacts so their calls will always go through). As far as I can tell, this feature — known as "Shush" — isn't yet active in the current Android P beta. It sounds like it'll be arriving in a subsequent release later this year. Now if only we could gain a similar sort of simple-shush gesture for people in the real world, we'd really be set.